Session organizers are welcome to engage the theme in creative, challenging, and innovative ways. This call will generate session topics for conference participants to choose from during the Call for Abstracts in April. Session organizers for included sessions are responsible for accepting or declining participants to their sessions. There you will find all the sessions and conference activities. You can plan which sessions you want to attend, and you can also sort by presenter. You should use this in lieu of a formal index in looking for specific presenters (including yourself). You can also either create or edit profiles to maximize networking opportunities and to let other attendees know more about yourself and your research. Technology: All session rooms are equipped with a projector and screen. Presenters will need to supply their own laptop or connect with other presenters in the session to use theirs. Mac users: please bring an adapter to connect to the projector. All session rooms also have wifi, as does the main meeting area. Enter and Verify your email address. Click on “View or Change Your Existing Registration”. It is right below “Verify Email Address”. When you get to the next screen, click on the link for “View, Print, or Email Registration" which is right under your name. The 2017 Conference will take place in Windsor, Ontario, Canada. It is directly across river and accessible from Detroit, Michigan, USA. The Windsor Airport is approximately a 20-minute taxi ride to our property. Taxis are usually awaiting arrivals and if not, there are taxi phones available. If you are flying into this airport from a US destination, you will require a passport. The Detroit Metro Airport is approximately 25 minutes away from the Canada/U.S. border by car. Those flying into Detroit. (From Conference Director William Bridel) A situation has recently arisen in Windsor, namely needed repairs to the ceiling of the tunnel, which requires that the tunnel from Detroit to Windsor be closed fully for 10 days, scheduled to end on October 30th. Following that date, for the next few days the tunnel will be closed overnight (around 8pm to 5am); that said, it will be open Friday and Saturday nights, which is when delegates should aim to go to Detroit if that is part of your plans. Delegates coming into Detroit airport at night on October 31, November 1, or 2 will not be able to take the tunnel to get to Caesars Windsor, as the tunnel will be closed. This is not a big problem as the travel distance in Windsor from the Ambassador Bridge to the tunnel/official hotel is only about 5-minutes by car, but you will want to avoid the tunnel if travelling those nights (so plan to take the bridge instead). Options to get from Detroit airport to Caesars Windsor: The Robert Q is one option to get from the Detroit airport to Windsor https://reservation.robertq.com/airbus/ but it only goes to a hotel near the Ambassador Bridge, so delegates would have to take a short cab ride after that to Caesars Windsor. A limousine service is available as well, and can be booked at http://metrocars.com/index.html and should also be available on standby; the cost will be roughly $75 US. Taxis may also be available from the Detroit airport to Caesars Windsor but they will charge by the meter (which could cost more or less than using Metro Cars, depending on delays due to road construction or at customs). There are car rental places near the airport, so that could be an option – rent a car, schedule a time when others can come with you from the airport (sharing the cost), and that gives you the option of having the car while in Windsor. There’s free parking at Caesars Windsor. Here are some other local restaurants that are near the hotel. Detroit Red Wings home game: Tuesday, October 31, 7:30pm against Arizona. Windsor Spitfires (Jr A Hockey): Thursday November 2, 7:05 against Hamilton. Thanks to Vicky Paraschak and the Conference Site Committee. 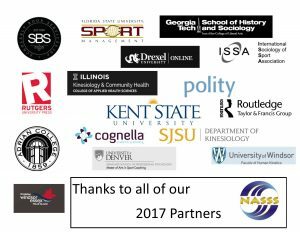 The NASSS Conference is a great place for grad students to meet each other and to interact with faculty in their field. As the conference approaches, we will add information for grad students here. The annual Graduate Student Panel Lunch will take place at Noon on Thursday, November 2nd in Augustus 1. There will be a Grad Student Social Night on Thursday, Nov. 2, starting at 8 p.m. All grad students, and grad students at heart, are encouraged to come to the Foundry Pub, located at 459 Ouellette Ave, in Windsor, Ontario (it is about a 12 minute walk from the conference hotel). This is an informal social, where you can come and go throughout the night as you are available. This pub has a small kitchen, so you can order food but you should not all plan on ordering your dinner at the same time. The back area of the pub has been reserved for us. The Facebook page for the restaurant can be found here. The annual Take a Student to Lunch event will take place on Friday, November 3, 2017, from 12:00 p.m. - 1:15 p.m. We will be meeting in Augustus 1. Faculty or students who signed up should have received an email with more information on your lunch pairings. If you cannot access this information, we will have it at the event. If you did not sign up, as either a faculty or student participant, but would still like to participate, please come to Augustus 1 at the beginning of the event and you will be paired up with somebody. If you need more info about Graduate Students and NASSS, check out our Graduate Student Pages or contact grad rep Sam Twito (twito@utexas.edu) with any questions. Dan Henhawk has compiled a short list of readings (attached) with which NASSS scholars might consider reading prior to the conference. These books/articles are some of the most widely-cited works in the areas of indigenous and postcolonial studies (and sport studies/sociology) and provide important historical context and political/theoretical praxis from which to (re)think sport, identities, and inequality in the ongoing struggle against colonialism and colonization. Forsyth, J. & Giles, A.R. (Ed.). (2013). Aboriginal peoples and sport in Canada: Historical foundations and contemporary issues. Vancouver: UBC Press. Forsyth, J., & Wamsley, K. B. (2006). “Native to native … we'll recapture our spirits”: The world indigenous nations games and north American indigenous games as cultural resistance. The International Journal of the History of Sport, 23(2), 294–314. Fox, K. M. (2006). Leisure and indigenous peoples. Leisure Studies, 25(4), 403-409. Fox, K. M. (2007). Aboriginal peoples in North American and Euro-north American leisure. Leisure/Loisir, 31(1), 217. Grande, S. (2004). Red pedagogy: Native American social and political thought. Lanham, MD: Rowman & Littlefield Publishers, Inc.
Paraschak, V. (1989). The native sport and recreation program, 1972-1981. Canadian Journal of History of Sport, 26(2), 1-18. Paraschak, V. (1990a). Native sport history. Canadian Journal of History of Sport, 20, 57–68. Paraschak, V. (1990b). Organized sport for native females on the Six Nations Reserve, Ontario from 1968 to 1980. Canadian Journal of History of Sport, 21(2), 70–80. Paraschak, V. (1997). Variations in race relations. Sociology of Sport Journal, 14, 1–21. Paraschak, V. (1998). “Reasonable amusements.” Sport History Review, 29, 121–131. The Conference Program Committee has asked Dan Henhawk to provide a presentation on the ‘politics of openings’ at the beginning of our first member-wide session, the Ingham Memorial Address. After seeking advice from stakeholders within various First Nations communities, the committee was advised that a politics of openings address would be more appropriate than a conventional “land acknowledgement”—providing for a more complex and dialogue-building consideration of the role that sport and other physical cultural practices have played in historical and ongoing colonization and social injustice. This year’s main keynote speaker is Jesse Wente. According to his online bio, Jesse is "well known as a film critic and broadcaster in Toronto and across Canada, and was the first nationally syndicated Indigenous columnist for the CBC. He has also been a regular guest on CBC Newsworld’s News Morning and Weekend Edition, as well as Q. Jesse is Ojibwe, and his family comes from Chicago and the Serpent River First Nation in Ontario. He is an advocate for Aboriginal Arts, most notably on screen. He draws attention to the imagery used by Hollywood in portrayals of indigenous peoples and stresses the need for a culture to have influence on their own depiction. His pieces on The Revenant, Beyonce and sports mascots were among the most shared on CBC.ca. Thanks here to the University of Windsor for providing the financial support to facilitate Mr. Wente’s talk. The organizing group has contacted the Chiefs from both the Caldwell First Nations and Walpole Island First Nation and invited students and community members from their respective groups to attend Jesse Wente’s talk (or any other part of the NASSS proceedings). Click here to sign up for the Wikipedia Editathon on Elite Aboriginal Athletes in Canada on Wednesday, November 1st at the University of Windsor, just prior to the start of NASSS. All are invited to attend and assist us in this process. We would ask that individuals make a minimum commitment of 1 hour, and we’d appreciate those who can stay for half the day, or for the whole day. Librarians will be available for assistance in locating references that can be used to write and substantiate the entries. If individuals wish to assist from afar, we would ask that you identify the athlete(s) that you intend to write about, or send us references about that athlete that can be used by others to script out the Wikipedia entry. Individuals who are familiar with writing Wikipedia entries will be available to provide assistance. There are also modules we will recommend you work through beforehand to familiarize yourself with the Wikipedia method of writing/creating/editing/posting. 2-3 hour contribution – watch one of the Chiefs and Champions DVDs we have available (24 minutes) and then tie additional relevant materials into the existing entries, adding in the DVD reference as well. Athletes: Chief Roger Adolph, Alwyn Morris, Waneek Horn-Miller, Fred Sasakamoose, Tom Longboat, Billy Two Rivers, Angela Chalmers,Richard Peter, Sharon and Shirley Firth, Gino Odjick, Ross Powless, Darren Zack, Arthur Obey, Bev Beaver, Beverly Stranger, Bill Isaacs (taken), Carole Polchies, Charles Smallface, Jason Loutitt, Martha Benjamin (taken), Paul Goulais, Reginald Underwood, Rick Brant (athletics), Heather Kashman (Metis). Other elite Aboriginal athletes in Canada are also suitable for adding to these lists. Thanks to all who can come and help us on this important task. If you have any questions or prefer to participate off-site, sign up and email Vicky Paraschak (parasch@uwindsor.ca) to sort out the contribution you’d prefer to make. To access, meeting agendas, minutes, and bylaws changes, click here to visit the NASSS documents page. To see the 2017 Board reports prepared by the NASSS committees, visit the reports page. Thanks to Kevin Airgid for the photos of Windsor, Ontario.